The idea being an alarming one, he scrambled out of bed, and groped his way to the window. He was obliged to rub the frost off with the sleeve of his dressing-gown before he could see anything; and could see very little then. All he could make out was, that it was still very foggy and extremely cold, and that there was no noise of people running to and fro, and making a great stir, as there unquestionably would have been if night had beaten off bright day, and taken possession of the world. This was a great relief, because ‘Three days after sight of this First of Exchange pay to Mr. Ebenezer Scrooge or his order,’ and so forth, would have become a mere United States security if there were no days to count by. ‘A quarter to it.’ said Scrooge. It was a strange figure—like a child; yet not so like a child as like an old man, viewed through some supernatural medium, which gave him the appearance of having receded from the view, and being diminished to a child’s proportions. Its hair, which hung about its neck and down its back, was white, as if with age; and yet the face had not a wrinkle in it, and the tenderest bloom was on the skin. The arms were very long and muscular; the hands the same, as if its hold were of uncommon strength. Its legs and feet, most delicately formed, were, like those upper members, bare. It wore a tunic of the purest white; and round its waist was bound a lustrous belt, the sheen of which was beautiful. It held a branch of fresh green holly in its hand; and, in singular contradiction of that wintry emblem, had its dress trimmed with summer flowers. But the strangest thing about it was, that from the crown of its head there sprang a bright clear jet of light, by which all this was visible; and which was doubtless the occasion of its using, in its duller moments, a great extinguisher for a cap, which it now held under its arm. ‘Who and what are you?’ Scrooge demanded. ‘Long Past?’ inquired Scrooge, observant of its dwarfish stature. Perhaps Scrooge could not have told anybody why, if anybody could have asked him; but he had a special desire to see the Spirit in his cap, and begged him to be covered. Scrooge reverently disclaimed all intention to offend or any knowledge of having wilfully ‘bonneted’ the Spirit at any period of his life. He then made bold to inquire what business brought him there. It would have been in vain for Scrooge to plead that the weather and the hour were not adapted to pedestrian purposes; that bed was warm, and the thermometer a long way below freezing; that he was clad but lightly in his slippers, dressing-gown, and nightcap; and that he had a cold upon him at that time. The grasp, though gentle as a woman’s hand, was not to be resisted. He rose; but, finding that the Spirit made towards the window, clasped its robe in supplication. The Spirit gazed upon him mildly. Its gentle touch, though it had been light and instantaneous, appeared still present to the old man’s sense of feeling. He was conscious of a thousand odours floating in the air, each one connected with a thousand thoughts, and hopes, and joys, and cares long, long forgotten! Scrooge’s former self grew larger at the words, and the room became a little darker and more dirty. The panels shrunk, the windows cracked; fragments of plaster fell out of the ceiling, and the naked laths were shown instead; but how all this was brought about Scrooge knew no more than you do. He only knew that it was quite correct; that everything had happened so; that there he was, alone again, when all the other boys had gone home for the jolly holidays. A terrible voice in the hall cried, ‘Bring down Master Scrooge’s box, there!’ and in the hall appeared the schoolmaster himself, who glared on Master Scrooge with a ferocious condescension, and threw him into a dreadful state of mind by shaking hands with him. He then conveyed him and his sister into the veriest old well of a shivering best parlour that ever was seen, where the maps upon the wall, and the celestial and terrestrial globes in the windows, were waxy with cold. Here he produced a decanter of curiously light wine, and a block of curiously heavy cake, and administered instalments of those dainties to the young people; at the same time sending out a meagre servant to offer a glass of ‘something’ to the postboy, who answered that he thanked the gentleman, but, if it was the same tap as he had tasted before, he had rather not. Master Scrooge’s trunk being by this time tied on to the top of the chaise, the children bade the schoolmaster good-bye right willingly; and, getting into it, drove gaily down the garden sweep; the quick wheels dashing the hoar-frost and snow from off the dark leaves of the evergreens like spray. You wouldn’t believe how those two fellows went at it! They charged into the street with the shutters—one, two, three—had ’em up in their places—four, five, six—barred ’em and pinned ’em—seven, eight, nine—and came back before you could have got to twelve, panting like racehorses. Clear away! There was nothing they wouldn’t have cleared away, or couldn’t have cleared away, with old Fezziwig looking on. It was done in a minute. Every movable was packed off, as if it were dismissed from public life for evermore; the floor was swept and watered, the lamps were trimmed, fuel was heaped upon the fire; and the warehouse was as snug, and warm, and dry, and bright a ball-room as you would desire to see upon a winter’s night. In came a fiddler with a music-book, and went up to the lofty desk, and made an orchestra of it, and tuned like fifty stomach-aches. In came Mrs. Fezziwig, one vast substantial smile. In came the three Miss Fezziwigs, beaming and lovable. In came the six young followers whose hearts they broke. In came all the young men and women employed in the business. In came the housemaid, with her cousin the baker. In came the cook with her brother’s particular friend the milkman. In came the boy from over the way, who was suspected of not having board enough from his master; trying to hide himself behind the girl from next door but one, who was proved to have had her ears pulled by her mistress. In they all came, one after another; some shyly, some boldly, some gracefully, some awkwardly, some pushing, some pulling; in they all came, any how and every how. Away they all went, twenty couple at once; hands half round and back again the other way; down the middle and up again; round and round in various stages of affectionate grouping; old top couple always turning up in the wrong place; new top couple starting off again as soon as they got there; all top couples at last, and not a bottom one to help them! When this result was brought about, old Fezziwig, clapping his hands to stop the dance, cried out, ‘Well done!’ and the fiddler plunged his hot face into a pot of porter, especially provided for that purpose. But, scorning rest upon his reappearance, he instantly began again, though there were no dancers yet, as if the other fiddler had been carried home, exhausted, on a shutter, and he were a bran-new man resolved to beat him out of sight, or perish. There were more dances, and there were forfeits, and more dances, and there was cake, and there was negus, and there was a great piece of Cold Roast, and there was a great piece of Cold Boiled, and there were mince-pies, and plenty of beer. But the great effect of the evening came after the Roast and Boiled, when the fiddler (an artful dog, mind! The sort of man who knew his business better than you or I could have told it him!) struck up ‘Sir Roger de Coverley.’ Then old Fezziwig stood out to dance with Mrs. Fezziwig. Top couple, too; with a good stiff piece of work cut out for them; three or four and twenty pair of partners; people who were not to be trifled with; people who would dance, and had no notion of walking. But if they had been twice as many—ah! four times—old Fezziwig would have been a match for them, and so would Mrs. Fezziwig. As to her, she was worthy to be his partner in every sense of the term. If that’s not high praise, tell me higher, and I’ll use it. A positive light appeared to issue from Fezziwig’s calves. They shone in every part of the dance like moons. You couldn’t have predicted, at any given time, what would become of them next. And when old Fezziwig and Mrs. Fezziwig had gone all through the dance; advance and retire, both hands to your partner, bow and curtsy, cork-screw, thread-the-needle, and back again to your place: Fezziwig ‘cut’—cut so deftly, that he appeared to wink with his legs, and came upon his feet again without a stagger. When the clock struck eleven, this domestic ball broke up. Mr. and Mrs. Fezziwig took their stations, one on either side the door, and, shaking hands with every person individually as he or she went out, wished him or her a Merry Christmas. When everybody had retired but the two ‘prentices, they did the same to them; and thus the cheerful voices died away, and the lads were left to their beds; which were under a counter in the back-shop. They were in another scene and place; a room, not very large or handsome, but full of comfort. Near to the winter fire sat a beautiful young girl, so like that last that Scrooge believed it was the same, until he saw her, now a comely matron, sitting opposite her daughter. 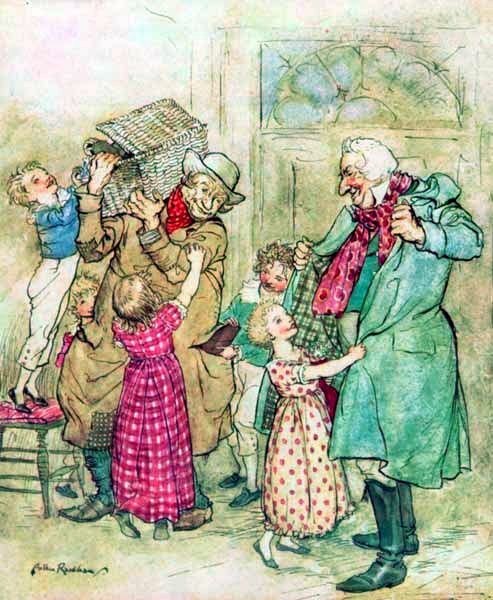 The noise in this room was perfectly tumultuous, for there were more children there than Scrooge in his agitated state of mind could count; and, unlike the celebrated herd in the poem, they were not forty children conducting themselves like one, but every child was conducting itself like forty. The consequences were uproarious beyond belief; but no one seemed to care; on the contrary, the mother and daughter laughed heartily, and enjoyed it very much; and the latter, soon beginning to mingle in the sports, got pillaged by the young brigands most ruthlessly. What would I not have given to be one of them! Though I never could have been so rude, no, no! I wouldn’t for the wealth of all the world have crushed that braided hair, and torn it down; and for the precious little shoe, I wouldn’t have plucked it off, God bless my soul! to save my life. As to measuring her waist in sport, as they did, bold young brood, I couldn’t have done it; I should have expected my arm to have grown round it for a punishment, and never come straight again. And yet I should have dearly liked, I own, to have touched her lips; to have questioned her, that she might have opened them; to have looked upon the lashes of her downcast eyes, and never raised a blush; to have let loose waves of hair, an inch of which would be a keepsake beyond price: in short, I should have liked, I do confess, to have had the lightest license of a child, and yet to have been man enough to know its value. But now a knocking at the door was heard, and such a rush immediately ensued that she, with laughing face and plundered dress, was borne towards it the centre of a flushed and boisterous group, just in time to greet the father, who came home attended by a man laden with Christmas toys and presents. Then the shouting and the struggling, and the onslaught that was made on the defenceless porter! The scaling him, with chairs for ladders, to dive into his pockets, despoil him of brown-paper parcels, hold on tight by his cravat, hug him round his neck, pummel his back, and kick his legs in irrepressible affection! The shouts of wonder and delight with which the development of every package was received! The terrible announcement that the baby had been taken in the act of putting a doll’s frying pan into his mouth, and was more than suspected of having swallowed a fictitious turkey, glued on a wooden platter! The immense relief of finding this a false alarm! The joy, and gratitude, and ecstasy! They are all indescribable alike. It is enough that, by degrees, the children and their emotions got out of the parlour, and, by one stair at a time, up to the top of the house, where they went to bed, and so subsided.